Email marketing is perhaps the most underrated form online marketing in South Africa. It is highly effective, simple to use, and used by virtually everyone who is online in the country. To give you a bit of context, we've gathered some key research about how people use email in South Africa. The figures in the report are based on a survey of almost 2000 random South African web users. The Demystifying the Inbox study found that 93% of SA web users share content on email, while only 56% use Twitter and 17% use Twitter. While the Facebook and Twitter figures are on the rise, email is still a very significant social content sharing channel. The Demystifying the Inbox study found that average South Africa gets between 120 - 200 emails per week. 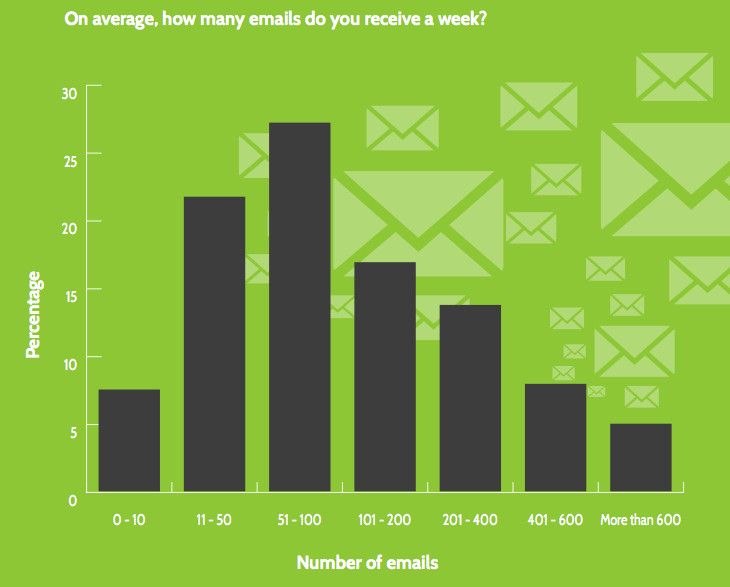 An interesting insight from the study is that the number of emails you get correlates with how much you earn. Higher income jobs are generally occupied by graduates and professionals who do much of their work on computers. So if you want to reach these people with email marketing, your messaging needs to compete for attention by being succinct and compelling. This is why we pay so much attention to email optimisation such as subject-line and call-to-action testing. People with higher income tend to subscribe to more newsletters. On average people earning above R30k per month subscribe to between 5 and 7 newsletters. Almost 38% of people earning more than R70k per month subscribe to more than 7 newsletters. Furthermore, the study found that 73% of South African email users have interacted with an email advert, and 54% of email users have purchased something they saw on email. This number will continue rising along with e-commerce use in the country, which is currently growing at 30% annually. An interesting insight is that women are more likely than men to click on email adverting. The industry body for email marketing companies in South Africa is the Direct Marketing Association of South Africa (DMASA), who also manage the National Opt-Out list of people who don't want to get any email or SMS communications from DMASA members. If you're collecting a list you need to ensure you're compliant with the Protection of Personal Information Act (POPI), which is all about protecting your consumer's private information from data theft or loss.